While serial interfaces have largely been replaced in the IT world by Ethernet and USB, they still have good standing in the industrial automation sector. Not only established devices are provided with on-board interfaces, but there are many new products, from barcode scanners and light screens to printers, weighing scales and operator terminals, as well as many drives, which use these interfaces for communication. This is why Turck has developed its IP67 Ethernet I/O module for connecting serial interfaces. Besides the two ports for RS-232 or RS - 485, the TBEN-S2-2COM-4DXP provides four digital inputs or outputs. The characteristics of the serial ports (RS-232, RS-485 or Modbus RTU) can be selected as required, and the I/O can be used here as input or output without any configuration required. The new TBEN-S modules simplify the connection of devices to a serial interface. Depending on the selected connection technology, the modules achieve IP65/67 protection, or even IP69K, and can therefore be used directly in the field at the machine. This shortens the wiring runs from the module to the devices in the field. Only one Ethernet cable and one power supply are run from the I/O module to the control cabinet. Both cables, power and Ethernet, can be looped through from module to module in a daisy chain, and in the ideal case, just have to be run once from the control cabinet to the field. The TBEN-S-2COM supplies smaller devices, such as barcode scanners with power via the bus connector – thus also reducing the time and costs required for wiring. Besides the savings possible in wiring, users of the module benefit from the fact that the programming required for communication with Modbus RTU devices is kept to a minimum. Modbus accesses normally have to be programmed and processed separately in the controller environment. Turck’s serial module comes with Modbus RTU already integrated. The user just has to configure the addresses and process data areas. The module then takes over the processing of the protocol and exchanges process data with the controller. Complicated function blocks for Modbus are not required. The module is thus the perfect counterpart for several Modbus RTU devices, such as smart sensors or the light curtains of Turck’s optical sensor partner, Banner Engineering. For example, up to 64 pick-to-light sensors of Banner’s K50 series can be run on just one I/O module – pick-to-light applications just became cheaper to set up. The module is also the ideal link to integrate existing Modbus RTU nodes in industrial Ethernet networks. Motors with serial interfaces are often used in the materials handling, logistics and packaging technology sectors. Good examples of this are the Movimot motors of SEW-Eurodrive. In RS-485 operation, up to 32 motors per port can be connected to the TBEN-S2-2COM. Banner’s QM42VT2 also provides a sensor for monitoring vibration and temperature that can likewise be connected with the module via RS-485. When mounted directly on the drive, it enables bearing damage to be diagnosed early on so that maintenance operations can be planned. This is a simple and efficient way of implementing predictive maintenance. Another feature opens up opportunities for Industry 4.0. Like all devices of the TBEN series, the TBEN-S2-2COM also supports Turck’s Ethernet multiprotocol technology, which enables the devices to be used in Profinet, EtherNet/IP and Modbus TCP networks. It is also possible to access the device via Modbus, even in parallel with the existing controller connections. For motor control with predictive maintenance, for example, the data of the vibration sensor can be sent directly to higher-level systems, such as Edge gateways, data hubs or cloud systems for further analysis. Many commonly available systems, such as Microsoft Azure, IBM Bluemix, as well as OPC UA servers from Matricon and Kepware, support communication via Modbus TCP. Like all the latest TBEN modules, the 2COM module also features the browser-based ARGEE programming environment for serial interfaces. ARGEE enables PLC functions to be programmed directly on the modules of the TBEN-L, TBEN-S, BL compact and FEN20 block I/O series. These types of field logic controllers (FLCs) enable elementary controller functions to be outsourced to the I/O modules, thus relieving the workload on the central PLC and the bus communication. The programming environment is a simple web application. It simply requires a PC with a web browser such as Chrome or Firefox. 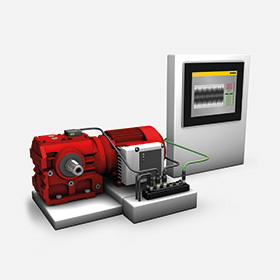 Requirements can also be implemented on the Turck block I/O modules completely autonomously. Programming could not be easier. In Simple mode, which is like a ladder diagram editor, dropdown fields provide the means by which inputs and outputs can be linked with Boolean operators and actions. This makes it possible to program basic functions without any knowledge of a programming language. Professional mode makes the entire range of functions available, which can also be used, for example, to implement sequential function charts. Serial interfaces still play an important role in many areas of industrial automation. This is why Turck has added the TBEN-S-2COM block I/O module to its TBEN-S portfolio and is thus consistently pursuing its ‘moving out of the cabinet’ strategy. The IP67 module offers two serial interfaces and four I/O channels. It communicates with the controller via Turck’s multiprotocol technology using Profinet, Ethernet/IP or Modbus TCP. This makes the module equally suitable for both general use in new installations and for retrofit projects. For anyone wishing to prepare for the future, the module brings serial interfaces into the era of Industry 4.0. The parallel communication via Profinet (to the controller) and Modbus TCP to Edge gateways or data hubs enables the intelligent evaluation of device data for predictive maintenance.